The Polysafe Pedestrian / Bridleway system uses revolutionary lightweight panels and edge beams. Every component weighs less than 60kg so it can be fitted manually by 2 people without the need for expensive machinery. The system has been fully approved by Network Rail (see Certificate under Downloads section). It is simple to fit, and unlike timber and heavier rubber systems they can then easily be removed and replaced during routine track maintenance, saving a fortune over time on plant hire and labour. 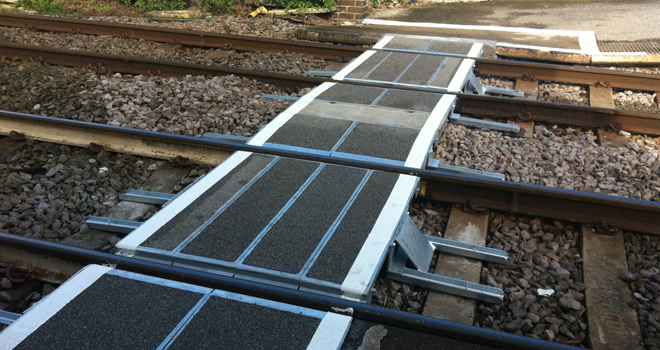 This made it the ideal system for an installation at Saltmarshe station, where the existing crossing was a traditional timber deck. This was easily replaced and now provides a level high grip surface for the public, with clear lines that won't quickly wear off. From the maintainer's point of view, the system was quick and easy to fit by hand. And for ongoing maintenance, the main components can simply be unbolted and removed then put back into position and re-bolted - again all by hand. Simple, quick and very cost effective.